Lady and the Blog → Style → Summer Sale Round Up: All The Codes You Need For Deep Discounts Today! Summer sales are going STRONG. I mean – we just finished up with Amazon Prime Day and it’s so nice to see that the party is still continuing with some coupon codes from our favorite retailers. 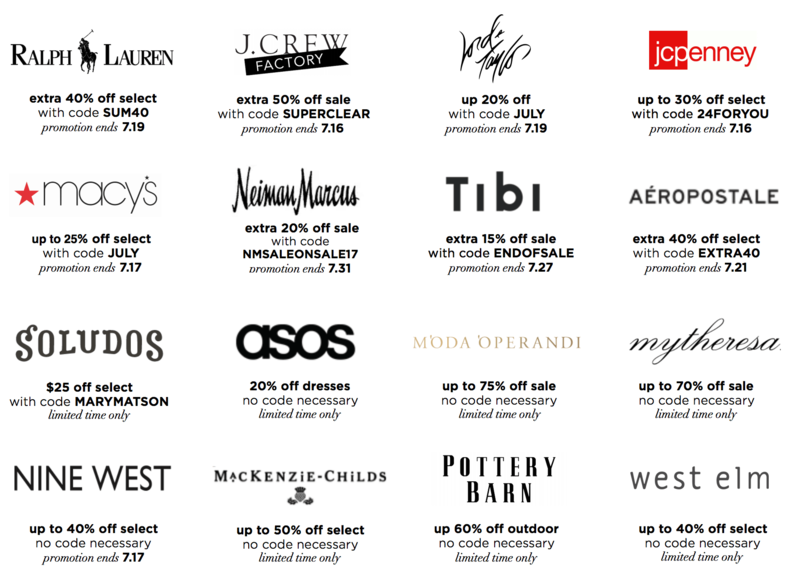 Whether you are looking for 20-40-50% off, there is a sale with your name on it happening RIGHT NOW. Check out all the codes I found online and enjoy whatever bargains you might come across!! And more! Just check out the codes above to enjoy deep discounts this week. In celebration of National Summer Learning Day, regular-price Lands’ End Kids graphic tees will be 50 percent off for one day only on July 13. You cannot miss out on this. Which sale are you most excited about?